Wife says her cheese enchiladas were the best she has ever had and quite different from the nor. Slightly spicy (and she doesn't normally like spicy). I had Horchata and a beef with nopalitos, quite good. Salsa and chips were OK but the corn tortillas were great. My husband and I were traveling in the area visiting Guadeloupe National Park and Carlsbad Caverns. We stopped here for dinner one night and we were not disappointed. I was a little skeptical since some reviews we read were not ringing endorsements. However, the jammed parking lot and line to be seated quelled our trepidation. We were quickly brought a basket of fresh trips and fresh salsa. The menu was full of many tempting choices. I went with the chicken enchilada suiza. It was delicious and super filling. Service was quick and friendly! 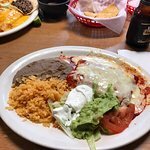 It’s not a super fancy spot, but for tasty Mexican food and friendly service...head on in. Got into Carlsbad too late to see the bats leave the cave;(and wanted Mexican food so the girls at our motel check in recommended this restaurant without question. A very busy place. Casual. Family friendly. A few tv screens. Small lounge area. Big open dining area like a cafeteria with booths or tables. Seems to be popular with local workers and families.The restaurant seems to be managed well. Plenty of servers working. Whatever you decide to eat be sure to use the 2 bottles of sauces ( green n red). We ate here on a Friday night. There was a 10 minute wait but we didn’t mind waiting. It took way too long for our food to come out. A table that sat seconds before us received their food and left before our food ever arrived. (And we didn’t have anything complicated or that took awhile to cook) once we finally received our food two of the orders were messed up and at that point we just ate what we received. Not sure what was wrong with the kitchen. Food tasted pretty good though. 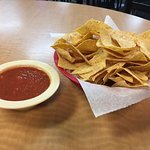 My friend and i stopped here after going to caverns, the food was ok i ordered enchilada, taco and rice i got something else brought to me but the taco and rice were good. My friend ordered chicken quesadillas and she received just cheese no chicken she said it was ok.
Been to El Jimador? Share your experiences!